All Droids in SWGOH Ranked! 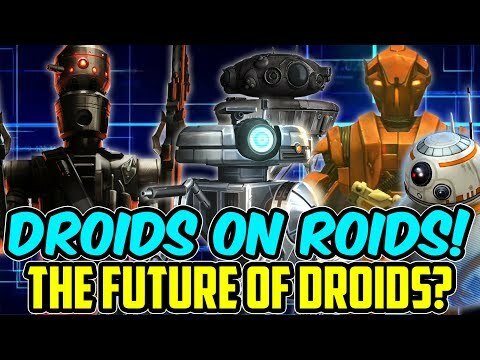 Hey everyone, here is a rundown of what I believe are the best droids in the game in order. Maybe for new players, it’d be helpful to those who like droids. This list is for every droid's overall usefulness in the game, not just a few modes or not. This is only my opinion, so elaborate what should be different in the comments if you think something isn’t right. 1. C3PO. Obviously, the golden god deserves to be up here. Probably one of the hardest to acquire out of this list, he makes CLS teams amazing, supports Ewoks, brings JTR teams back from dump, helps give Finn a chance in the meta, and helps Solo the HAAT very easily. He can help out droids quite a bit too, but unfortunately lacks the direct synergy to do so very effectively. 2. R2-D2. A lot like C3PO, he can fit into quite a lot of teams and make them very good. He has a place in the meta right now thanks to C3PO with CLS, and is the best third member for a JTR team. His zetas are some of the best in the game, and he has a bit more direct synergy with droids. 4.IG-88. A glass cannon if there ever was one, IG-88 has some of the most diverse uses in the game. His damage is insane, and he lands a lot of debuffs. He is easily farmable, and can be used either in a bounty hunter team or a droid team to great effect. He also has target lock, a very powerful debuff when used with T3-M4 and Imperial Probe Droid. He can also be used in the Chewbacca legendary event. Being a scoundrel let’s you use him in credit heists as well. He also owns a ship, which is pretty good paired with other bounty hunter ships, which are all needed to unlock the legendary Millenium Falcon, one of the best ships right now. 5. L3-37. One of only two scoundrel droids (the other being IG-88), L3-37 is one of the best scoundrels in the game period. She is super tanky, taunts, gains extra health, defense, and counter chance. She heals her scoundrel and droids allies and taunts quite often, also gaining turn meter when another droid or scoundrel gets attacked. The best part is her cleanse. Whenever she gets attacked, she cleanses a random scoundrel ally of their debuffs, which can be very powerful and annoying if you’re going up against her. Her zeta is a mini savior ability like Revan's for droids. 6. Chopper. Though not an amazing droid, Chopper carries his true title of a support character by taunting, dispelling buffs, and healing lots of protection. He also decreases cooldowns on droids and Phoenix. He is an easy farm. He is also a very important character in the beginning of the game, going with the Phoenix against Thrawn, thus acquiring one of the best characters in the whole game, Thrawn himself. He is also needed for the ship Phantom II, which is needed for the legendary event to acquire Thrawn's capital ship. 7. Imperial Probe Droid. This guy is the only Empire droid, thus helping him be a bit more versatile with the few good empire leads. His zeta allows him to apply a target lock that prevents buffs, he exposes on his basic, and he gains turn meter whenever a droid or empire ally uses an ability. His second special is basically suicide for the cause, allowing him to kill himself, yet dealing massive damage to the enemies on the table, many times taking out a high health and protection character with one shot. He is a hard farm though. 8. T3-M4. This old republic droid is essential to unlocking Revan, who is one of the best characters in the game, on par with Thrawn. He also transforms the droids into some of the heaviest hitting machines in the game. Unfortunately outside of droids and unlocking Revan, he isn’t much good elsewhere, so he has to come in lower than the rest. But still a very good droid. 9. HK-47. This guy's kit is trash, I’ll just go ahead and say that. But his leader ability is really the only good leader ability for droids out there, and though it’s simple and small, it still holds quite a lot of viability for droids. 10. B2 Super Battle Droid. Once used on almost everyone’s team in arena back in the day, the separatist droid ruled with his amazing kit. Buff dispelling and immunity, turn meter gain whenever another ally was hit, it was a very simple kit, yet did the job. He can be implemented in almost any team, although many better replacements for him have been released since. He is also a little too squishy to work very well in PvP, and his damage is ridiculously low. 11. K2-SO. It’s sad to see my all time favorite droid in the Stars Wars universe to be so low on the list, but K2-SO just can’t cut it well. With one of the worst zetas in SWGOH history, his kit is just pretty bad. His taunt and counter chance are just not enough to make him good. In a rogue one squad he can do some good things, especially paired with Cassian, but his versatility in the game is limited. He can be used in TB missions to earn your guild TB guild currency. 12. IG-86. A super damage dealer under the right leader, IG-86 has no synergy except with droids. Pretty squishy, his OK kit is best replaced by much better characters. He used to be meta, but he’s fallen by the wayside. He may have uses here and there for TW, but outside of that, he’s pretty much useless. 13. General Grievous. Now we reach the dregs of the sewers, where all the thrown out characters hang out, shells of what they once were. GG is one of them. I don’t know where to start. Despite having healing immunity, extra health with droids, a nice simple basic and his cool look, this poor rejected fella is one of the worst characters in the game. Synergy with droids, yes, but his kit is so terrible it doesn’t even matter. With the worst leader ability in the game, he has a cult following that shouts from the rooftops that he be reworked. #reworkgrievous. He absolutely needs it. 14. IG-100 MagnaGaurd. This bodyguard of Grievous is doing just fine hanging out with him in the sewers. The guys kit is trash, his damage is garbage, and his speed is so bad it’s not even worth looking at. I’m done talking about him. I’m just glad that he doesn’t allow Grievous to take last spot on this list, that’d be heartbreaking. Threres nothing good to say about him. So what’d you all think? Please show some support by commenting your thoughts, I spent an hour working on this, and I’m about done typing on my keyboard. It’d mean a lot to spend some attention on this post, I believe I’ve never written so long of one. I hope it helps all of you, I did have fun making it. May the force be with you. I really enjoyed reading this post. My droids haven't been geared high enough and I mostly only use IG-88 in my BH teams so this was very informative. Posts like this make me want to try out new teams. Hope we get a droid buff in a future TW to give me a little more incentive to gear them up and try them out. It's posts like these that I want to see on the forum, informative with well thought out opinions. Hope there is some others with good knowledge to give some counter points. Would love to see more posts like this on other large factions (rebels, scoundrels, sith, empire...). Having 88 over BB8 & L3 is utterly ridiculous. Thank you very much for the support, I really appreciate it! It seems that way, but my goal was to look at the overall versatility of each droid, not how good their kits are. The only reason I mentioned some of their kits is because they’re so bad. IG-88 has WAY more usefulness than those other two. The others are awesome droids, but only fit in a few teams at the most and less game modes than 88. Good job mate! Very nice guide indeed! Enjoyed the read. Thx for taking the time. @VeNeNo thank you very much! Mmmmm I think BB8 is key to a lot of raid teams. That puts him over IG 88 every day. I give you that Ig 88 has more uses since he can be used with droids and BH, plus he has a ship that is key to unlocking the ****. But L3 ship is also amazing. Is a narrow call. Yeah, good points. I was struggling with some of the droids on where to rank them, some were just about as versatile and good as the others. I forgot to mention about BB-8 in raids though, good call! Yeah, just about the only downfall he has. IG is also pretty key to some teams, but doing P1 of str without BB would be way tougher. So BB is vital to both droid and resistance teams, while IG is vital for his ship, he isnt at the same level as BB. The lower end droids could really use some love, the DS droids need a boost. I enjoyed the list, but how you can put IG88 above BB8 is beyond me. IG88 has some interesting tools but he’s such a twig it almost makes him useless. He would be WAY down my droid list. Urzatron has made a very good case for Lobot being the best droid lead (not HK). Lobot offers cleansing and healing as well as more speed and Potency which is something all droids use. So according to all of the thoughts on here, (which I really appreciate) I have moved BB-8 up above IG-88. BB8 is more critical to teams that matter more. Particularly JTR in STR1, and then resistance teams where ever. Ig88 is more critical to teams that matter less. In terms of ships Ig88 might be closer to fleet meta. Once BB8 gets added to Poes ship maybe things will be different. That is out of importance though. It is quite possible for someone to use IG88 in some valuable spots in the game. My HK 88 86 Poggle Daka team unlocked all of my Dark Side Battles. I’ve seen video proof of that! Ahnald is the best swgoh you tuber in my opinion, close to MG. I know people love this guy but I absolutely cannot stand him. His info is good, but it's like somebody turned his internal volume knob up to the max and then broke it off. Like, bro, you don't need to shout every single word. You're talking into a mic. We can hear you. HK has the only viable droid leader ability, and you're saying he's the NINETH most valuable? What, can you have a team of 9 droids? HK is at minimum 5th. Lol, this made me laugh. Did you actually read my post? I mentioned droids overall usefulness in the whole game, and HK is only a good leader. Droids don’t have to be paired with just droids. If that were the case, then HK would definitely be higher up there. But this is not talking about solely Droid only teams. HK is a terrible guy besides his lead, and his great lead just can’t make him good enough to compete or be on par with the other droids above him. I think L3 is far superior to IG-88. You made a good argument about this droid is needed to unlock Chewbacca and the Falcon but you don't need a 7 star IG-88 for the Falcon, just the droid unlocked and its a lot easier to use other Bounty Hunters over him. He's an optional requirement. L3 has more utility and synergy with characters as he is considered a Rebel, Scoundrel, and a Droid. He also has a ship that is one of the best ships in the game. But I get ya, I forgot about l3’s ship.